I can hardly believe that July is almost over! Where has this summer (and this year) gone?! This month seems to have gone by especially fast for me. I think the change in my medications had me rather foggy most of the month making it feel like a blur. I’ve adjusted to the change, but found that the side effects don’t outweigh the benefits on this one, so the next time I go to the doctor I’m going to ask to be taken off of it (which shouldn’t be a problem at all). I started going to PT this past week. So far it made my back waaaay worse than it was and then my follow-up appointment on Tuesday was canceled until this coming Tuesday, so I don’t really have much of an idea where it all stands other than so far it hasn’t helped at all. 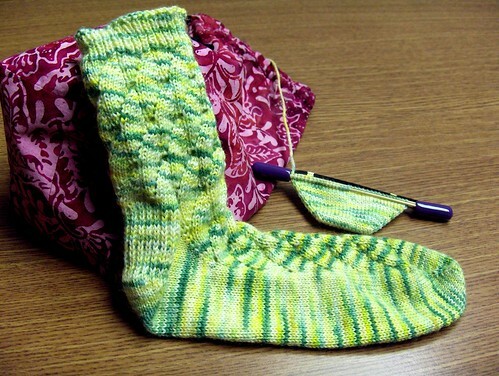 Aside from that stuff, I’ve been knitting on my Nanner socks like crazy. 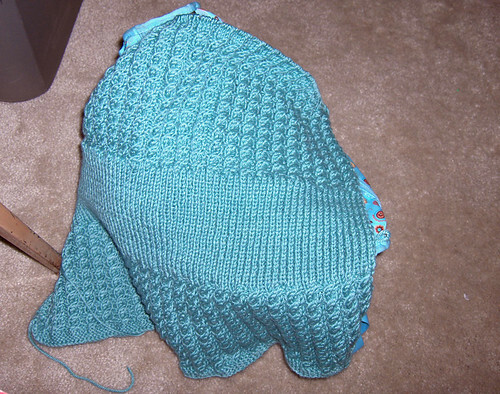 I finished the first one on Thursday and started the second one the same day. I’ve now completed the heel of the second sock, so I should be done with this pair very soon. I have three ripe tomatoes and plenty more on the way. The bell peppers have finally started showing and a few more cucumbers have come up, too. I’m not convinced that they are doing that great, but they’re doing okay enough I guess. The thyme and cilantro died completely and I pulled them out of the container they were in. The lavender and lemon balm aren’t doing so great and I’m not sure what to do about it. I trimmed back the lemon balm because it was getting a bit out of control. Seems okay enough, but the lavender – I have no idea what to do about it. It is looking rather wilted at the moment. Overall, though, I’m just really happy about the success I’ve had! Today I baked up some chocolate banana bread since we had some bananas that needed to be eaten or baked up. I think it came out really good! I’ve made it before, but it’s been years since I made it. This recipe is definitely a keeper! Preheat oven to 350 degrees F. Grease a loaf pan. Cream together butter and sugar. Add eggs and crushed bananas, combine well. Sift together flour, cocoa powder, baking soda and salt. Add flour mix and vanillia to creamed mixture, combine well. Pour into prepared loaf pan and bake at 350 degrees F for 60 minutes, or until done. Cool, serve and enjoy!